In an industry that moves as fast as PPC, reading industry blogs is a must. Sure, you can learn PPC from books, but the unfortunate aspect of PPC books is that portions of them are outdated as soon as they hit the shelves. Blogs are inherently more up to date, so they’re a great source of PPC news and views. And new blogs are constantly coming on to the scene. I wrote a post 2 years ago on the top PPC blogs, and it already needs updating. Here are the top PPC blogs you need to be reading right now. Search Engine Land – as industry news sites go, Danny Sullivan’s Search Engine Land is the gold standard, with articles from nearly every PPC luminary out there. The SEM Post – Curated by Jenn Slegg, The SEM Post covers just about everything that’s new and interesting in PPC and search in general. (Disclosure: I write a regular column for The SEM Post). Inside Adwords blog – this is the place for Adwords product announcements and the official word from Google. Bing Ads blog – Bing posts product announcements here, and also includes great industry stats, demographic info, and other interesting PPC stuff. Neptune Moon – Julie Friedman Bacchini has one of the most fun blogs to read out there. An author after my own heart, she’s not afraid to speak her mind. She wrote a great post for me a few weeks ago, too. The Seer Interactive Blog – Covering all aspects of search and analytics, look to Seer for new PPC ideas you hadn’t thought of before. Merkle RKG Blog – these guys are the smartest folks in PPC. If you want to really nerd out and test the boundaries of your PPC technical chops, this is the place for you. 3Q Digital Blog – You’ll find how-to’s and helpful info here. I especially like all of their articles on Facebook Ads. PPCChat.co – OK, this isn’t a traditional blog, but rather a collection of screencaps from the weekly PPCChats on Twitter. If you missed a chat, or want to refer back to one later, this is the place. Are you reading all of these blogs? If not, what’s stopping you? What are your favorite PPC blogs – did I miss any? Share in the comments! Last week, I read a fascinating article on MediaPost about Google’s “planned failures.” The great gift of the internet and digital world, according to the Googlers quoted in the article, is the ability to fail fast. “The price of failing slow is high,” it says. Google has had tons of failures. Some, like Froogle, morphed into something else over time. Some, like Google Reader, became outdated. Some, like Knol, just died. Many would say that other projects should die, such as self-driving cars or Google+. Probably Google’s biggest, or at least most well-known, recent failure is Glass. I wrote about why it failed in MediaPost a while back. Coming up with crazy projects is in Google’s DNA. Some of them work, some don’t – but most failed quickly. Fail fast, learn fast is their motto. I like to apply the same principle to PPC. Not that I plan to fail, but we all know that not everything we try in PPC is going to work. Some keywords will drive hundreds of clicks without a single conversion. An ad copy variation isn’t going to convert. Some landing pages are less than ideal. Or you forgot to exclude mobile apps in a display campaign (don’t ask). With even the most egregious PPC failures, though, we should always learn something – just like Google does. Google learned that people aren’t ready to wear weird glasses to take pictures and search for stuff. But you can bet they’ll take the best aspects of that technology and roll out with something else. That’s what you need to do in PPC. Find the losers and pause them – but then study them to figure out why they were losers. Found an ad that performed terribly? Why? Was the headline weak? Did it include ambiguous phrases? Was there an unfortunate instance of DKI in there somewhere? Did it lead to the wrong landing page? Use these learnings to fix what’s broken. I always tell new PPC hires that almost nothing is permanent in PPC. That bad ad, keyword, or display placement can almost always be spotted very quickly – within a day or two if you’re doing your job well – and paused with (usually) minimal ill effects. I’ll even report on bad stuff – clients need to know why things didn’t work. I don’t generally call attention to outright mistakes, but I do point out keywords that didn’t work or ad copy that didn’t resonate. One such conversation with a client recently led to the decision to create a new landing page that’s more relevant for a subset of client keywords. That’s a good thing! We failed fast and learned fast. It’s also good to start strong to learn fast. We’ve all had clients who launch in the middle of the month, even though they may have assigned a full month’s budget. I almost never pro-rate the spend. For instance, if the budget is $10,000 and we launch on the 15th, I don’t aim to spend $5,000. I aim to spend $10,000. Fail fast, learn fast. That way, month 2 hits the ground with a fine-tuned campaign, instead of waiting 2 more weeks to learn stuff. What about you? Do you fail fast and learn fast? Or are you more conservative? Share in the comments! By now, we’re all accustomed to being followed around by remarketing ads. Those of us in PPC are particularly attuned to remarketing ads. We know what they are, first of all. Most of us can probably spot a remarketing ad on the first impression. Second, we visit a lot of different websites as we research competitors, read news, and check display campaign placements. It always makes me chuckle to see our clients’ competitors as I move about the web. I don’t blame the competitors for following me; after all, they don’t know why I was on their site and didn’t convert. As long as they don’t show me hundreds of impressions per day, it’s not a problem. Then again, there are some remarketing ads that seem nearly ubiquitous, almost to the point of harassment. Now, I think WordStream has good products – I’ve praised several of them in posts I’ve written. And I have nothing but respect for Larry Kim, their CEO. But I gotta be honest – I’m tired of seeing their ads all day long, everywhere I go. How to avoid harassment: Use frequency caps! I usually start with 5 impressions per user per day. And even that might be high – I’ve gone as low as 1 per day. Now, I’m sure the fine folks at WordStream have probably tested the frequency threshold and likely are serving the right number of impressions to drive the results they’re looking for. But gosh, these ads are everywhere. I’ve even tried to get them to stop showing by going to different pages & sites – I gave up after about 50 impressions. This week, I got to thinking about another, bigger problem: showing salesy remarketing ads to people who already use your product. I credit my co-worker, Ben Nusekabel, with pointing this out. Here’s the ad he sent me – for the project management software we all use every day! Now, I love so many things about this ad: the copy, the art, the call to action… If I’d seen it, I probably would have downloaded the ebook! But here’s the thing: they’re wasting money on me, because I work for a company that already uses them. The solution? Don’t remarket to people who log in to your site. Create an exclusion list for them. 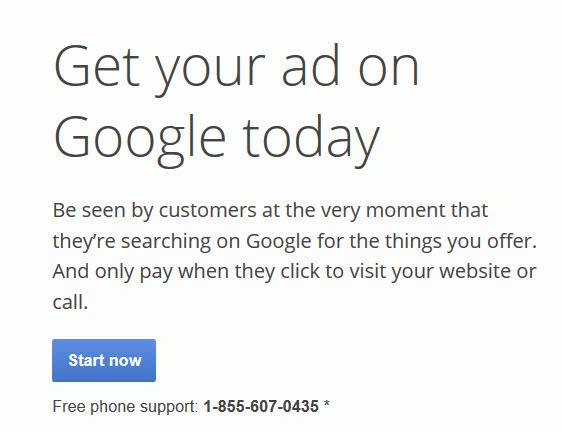 Yes, our friends over at Adwords want me to check them out. “Try Google AdWords,” they say. As if I’m not logged in to their interface from dawn till dusk. This one made me laugh out loud. Yet another example of Adwords not using their own best practices. I’d have been ok with seeing all of these ads if I weren’t logged in to their sites at the time I saw them. Makes me wonder if their PPC department or agency doesn’t understand how to use remarketing. At least it’s good for a few laughs. What about you? What are the craziest (or best, or creepiest) remarketing ads you’ve seen lately? Share in the comments! When I train new PPC hires, one of the questions they often ask me is, “How long does it take to get a PPC campaign running well?” It’s a fair question, and the answer isn’t what you might think. This is Google’s idea of how quickly a campaign can go live. They’re wrong. Here are 6 milestones that will take you on your way to a well-run campaign. Doing your homework is a must. 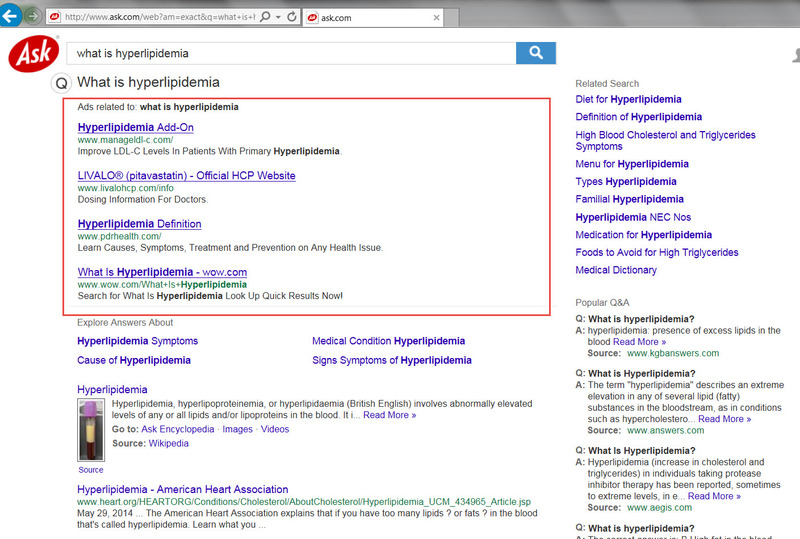 Guessing at keywords and creating one ad that lands on the homepage is not the way to approach PPC. You’ll need to think about campaign goals first, and then do your keyword research. Creating good ad copy is harder than ever with all the options out there today. Be sure to incorporate best practices. Campaign structure is also vital for success. Plan for expansion, and create campaigns and ad groups that will make management and reporting easier. If you don’t measure results, how will you know if the campaign is running well? Tracking setup can be very simple, using only Google Analytics or the engine conversion tracking scripts, or it can be ridiculously complex, with content marketing and CMS integration, call tracking, social media, and other integration elements. Set aside time to get the tracking right before you launch. Inaccurate tracking is worse than no tracking. Whether you’re in an agency dealing with clients, or in-house with a boss or CEO, someone will need to approve your campaign before it goes live. Chances are you’ll need someone else to set up the tracking on the website, too. Allow time for approvals – in my experience, a 2-day turnaround is lightning-fast, and it frequently takes a week or more for all approvals and tracking codes to be installed. Work that time into your launch plan. And if you’re creating new landing pages, plan on at least a month to get them up and running. Even with marketing automation, I’ve found it takes several weeks to create new pages, QA them, and get them ready for traffic. One of the great things about PPC is its immediacy – you can start seeing data right away. But just because you can see data the first day doesn’t mean you should act on it. Use the first days of a new campaign to trouble-shoot: ad disapprovals, broken links, and tracking issues are some of the roadblocks that can crop up in the early days of a new campaign. You should definitely look at the data to spot these challenges and fix them as soon as possible. But don’t fall into the trap of viewing performance after a couple of days or weeks and making huge decisions on it. Most campaigns need at least a month to really get a feel for performance. The first couple weeks will have huge swings in key metrics – so it doesn’t make sense to decide the fate of keywords and ad copy while things are going back and forth. Give it time. Campaign optimization should be ongoing, of course, but it’s in the first month or two that the most learning happens. You’ll probably find a couple of keywords and ad variations that perform terribly. As long as you remove them quickly, usually there’s little to no harm done. Fail fast and learn fast should be your motto. Reporting is another way to get your campaign performing well. In a report, you must show results, highlight key wins, and point out issues and problems. Even though you’re looking at your PPC data on a regular basis, you’ll probably see something in the first report that you didn’t notice before. And that’s ok. I always tell clients that their first report is going to be their worst report in terms of performance. It’s the baseline by which future performance is judged. And a good PPC report will facilitate a conversation between you and your client or boss that will help you get the campaign to perform better in the future. Work toward these milestones as you set up your next PPC campaign. What milestones do you look for in a new campaign? Share in the comments! Earlier this week, Susan Waldes caused quite a stir with her Search Engine Land post, Will Ask.com Google Arbitrage Ever Stop? Google arbitrage is the practice of advertisers buying Google Adwords ads for the sole purpose of driving traffic to their made-for-Adsense or other site where the primary goal is to generate ad revenue. Susan called out Ask.com for arbitrage practices, giving examples of how Ask.com buys traffic via PPC, and then sends it to their own search results pages – which are full of ads and links to other sites owned by the same entity that owns Ask.com. Susan garnered the attention of Ask.com’s CEO Doug Leeds with her post. In fact, he wrote a rebuttal to Search Engine Land that was published yesterday. You’ll notice that the ONLY ad at the top of the page is an Ask.com ad. And it’s a terrible ad. The whole premise of both the ad copy and sitelinks is, “Hey searcher, come to Ask.com to get answers to your questions!” Hey Ask.com, guess what? The searcher ALREADY ASKED A QUESTION! They want INFORMATION, not your crappy ads taking them to your crappy SERPs that do anything but answer the searcher’s questions. I added the red box. What’s at the top of the page? Arbitrage ads! Ads that Ask.com is profiting from! 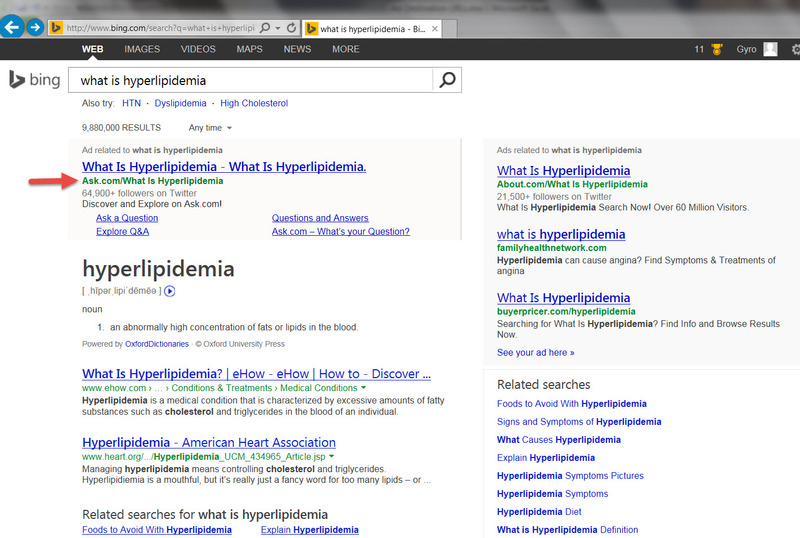 What other possible goal could their Bing ads have but to drive profit from their own ads? Isn’t that the definition of search arbitrage? In fact, look at the organic results on that Ask.com “landing page.” And look at the “ads” on the top right. All that stuff is driving traffic to Ask.com pages! Ask is taking their poor unsuspecting site visitors on a virtual wild goose chase through their various SERPs! It’s kind of like voice mail hell – every option you choose just takes you to something else that still doesn’t answer your question. That’s the antithesis of a quality landing page, in my book. What do you think? Is Ask.com the king of PPC arbitrage? Or are they justified in their actions? Is Doug Leeds admitting guilt with his rebuttal, or does he have a point? Share in the comments! PPC Experience: Necessary or Not? In many careers, the longer you’re at it, the better you get. Think about teaching or coaching, for example. First-year teachers can be downright scary to parents, because they lack experience and may not know how to handle tough classroom situations. The same thing goes for customer service. I worked in customer service for 4 years, and I definitely got better at it the longer I did it. But what about in PPC? After all, the only constant in the PPC world is change. Knowledge you had yesterday can be obsolete tomorrow – just look at what Enhanced Campaigns did to device-specific campaigns. So does experience matter? A flurry of fascinating conversation followed, with most contending that experience counts in many ways. Although performing actual PPC tasks may not require years of experience, knowing what tasks to perform does. A lot of people also talked about having general business savvy, which is something else that comes with time. We often find that junior staff (and this goes beyond PPC to all areas of the agency) are not experienced in dealing with clients, so they struggle with it. Let’s face it – client communication is a learned skill. When I first came to the agency world in 2007, I had a lot to learn, despite working in customer service for much of my career and in PPC for 5 years. So if you’re dealing with clients at all, experience definitely matters. I’ve worked with people over the years who were very resistant to change. Any time a new process was put in place, they complained and resisted it. I’ve even dealt with a few people like this in the time I’ve done PPC, although they’re usually not fellow PPC’ers, but rather people in support roles. Nonetheless, learning to adapt to change makes a difference, so if you’ve had experience with it before, it’ll likely be easier to swallow. So if you’re new to PPC or only have a year or two of experience, does that mean you’re doomed? Absolutely not! Willingness to learn, combined with a curious and positive attitude, is a good recipe for success in PPC. Some skills can be learned faster than others. I’ve found that daily PPC management tasks are easier to grasp, while dealing with clients and giving presentations are harder and take longer to master. But that’s a generalization: I’ve known people who were great with clients but shaky on the day-to-day. As with all things PPC, it depends! Did you see the discussion about PPC experience on PPC Chat? What do you think? Does experience matter? Share in the comments!